The motto "no guts, no glory" may need rewriting if Rice University synthetic biologist Jeff Tabor succeeds in his quest to help the Navy create an edible probiotic bacterium that can help protect sailors and marines from obesity and depression. "Our goal is to engineer a new probiotic bacterium that can protect against a common large-intestine disorder that causes obesity and depression," said Tabor, assistant professor of bioengineering at Rice and the lead investigator on a new project funded by the Office of Naval Research (ONR). A three-year grant from ONR's Young Investigator Program will fund Tabor's work, one of the first studies to combine two of the hottest fields in the life sciences—synthetic biology and microbiomics. Synthetic biologists like Tabor specialize in programming single-celled organisms like bacteria and yeast, much like one would program a robot. In particular, Tabor engineers bacterial sensors that can be used to detect a wide range of environmental information, including disease signals in the gut. By linking these sensors to synthetic genetic circuits—groups of interacting genes that carry out complex information processing—Tabor's team can program bacteria for advanced autonomous behaviors. In his most recent work at Rice, he and his students created a toolkit of bacterial light sensors and optical hardware to bring both mathematical predictability and cut-and-paste simplicity to the world of genetic circuit design. Probiotics—edible bacteria that improve health—are increasingly being used to treat diseases, but they have not yet become a major medical paradigm. In his new ONR-funded research, Tabor plans to program probiotics for highly reliable disease prevention in people with different genetic backgrounds, diets and so on. 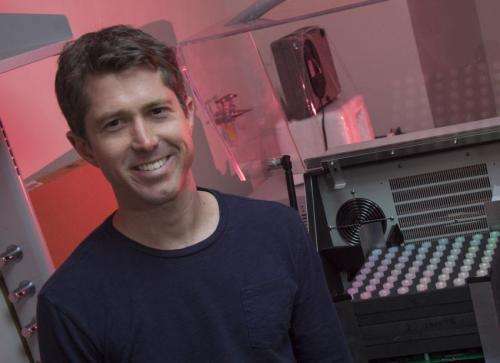 Tabor's team aims to do this by creating a network of genetic circuits that can sense, compute and respond to disease in a highly reliable way. "There are about 10 times more bacterial cells in our bodies than human cells, and numerous studies over the past decade have found that these bacteria play important roles in obesity, immune function, depression and other health processes," Tabor said. Collectively, the trillions of bacteria in our bodies are known as the microbiome. Innovative studies over the past decade have found that a person's microbiome contains more genetic information than the human genome. Increasingly, clinicians and scientists like Tabor are interested in finding ways to use the microbiome to treat disease and improve health. "The microflora in our bodies already help us digest food, fight off infection and stay healthy," Tabor said. "But there are some functions—including a number that would benefit human health—that evolution does not provide because they yield no competitive advantage for the bacteria. Our goal is to add these types of features using rationally designed genetic circuits. "For example, in this project we plan to engineer an organism that is always on the lookout for particular patterns of chemical biomarkers that act like a fingerprint for a weakened intestinal lining," he said. "When our bacteria detect those signals, they will respond by producing a different chemical that strengthens the lining and prevents disease-inducing molecules from reaching the bloodstream." ONR's Young Investigator Program is one of the oldest and most selective scientific research advancement programs in the country. The agency selected just 24 winners this year from a pool of nearly 280 applicants. ONR said the purpose of the program "is to fund early career academic researchers whose scientific pursuits show exceptional promise for supporting the Department of Defense, while also promoting their professional development." Tabor joined Rice's faculty in 2010. In his postdoctoral research at the University of California, San Francisco, he and colleagues programmed bacterial communities to function as a light-responsive photographic film and also to work as a parallel computer to perform the image-processing task of edge detection. Hell yeah. I saw this coming a few years ago. This is just the surface. GM bacteria over the coming decades will likely become as revolutionary as computers and the internet are. Sci-fi many times talks about nano-bots or nanites, etc. They essentially describe programmable bacteria if you think about it.